We provide food support to adults, children and families in need in Airdrie and surrounding communities. We collect food and funds from the community and distribute short term emergency food as needed to those in crisis. Together we build a stronger community. Together we are neighbours helping neighbours. As with many food banks in Alberta, the Airdrie Food Bank has witnessed a significant increase in food bank usage in the past year. Due to the downturn in the economy, there are many who have been layed off, had their hours and/or pay reduced. Many of these people have donated to us over the years and now find themselves on the other end of the stick. With increased support from our community, we are able to continue to provide food support to these individuals and families to keep them going. The gratitude they express is truly heartwarming. This is why we exist. It truly is neighbours that help neighbours. Together we are building a stronger community. Founded in 1984 by volunteers and local churches, the Airdrie Food Bank has grown with the community and in 2014 celebrated the opening of their new 6,000 sqft purpose-built facility. 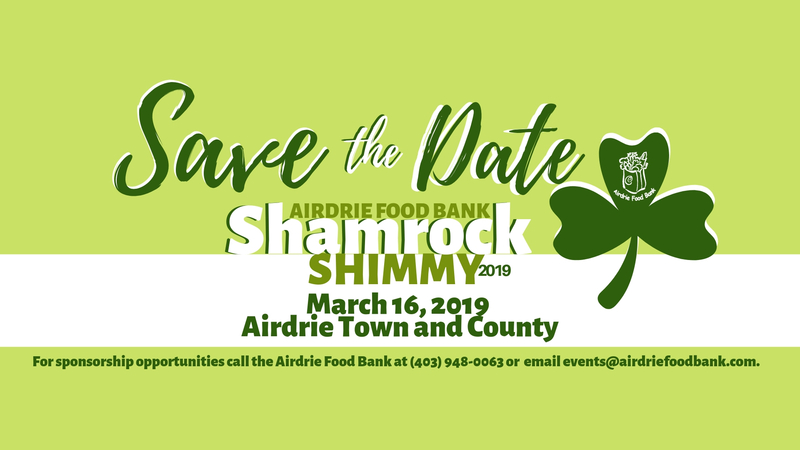 Offering expanded services as well as a new Community Kitchen, the Airdrie Food Bank provides support to those who live in Airdrie and surrounding area through the dedication of staff and volunteers. Mission: To collect and distribute food to those in need and help our community find solutions to hunger related issues. Vision: A community where no one is hungry. We value neighbours helping neighbours. Supply $4,600 in gift cards for perishables to local schools. Fort McMurray Assistance: Between May 1 and June 20 we provided 69 food hampers to a total of 237 people displaced because of the Fort McMurray fires. In addition, we gave out hygiene packs, kitchen supplies, baby items, toys and games. The Airdrie Food Bank provides a variety of programs in order to meet the need for emergency food support in families, individuals, adults, children and even babies! All who access our services are referred to other supports through our partnerships with other agencies. Our goal is to strengthen our program participants so they no longer require our services. Regular Hampers | Hampers provide 7 to 10 days’ worth of food for individuals and families. Hampers contain all food groups including meat, dairy and produce. Hampers can be accessed 6 times in a 12 month period and only once every 30 days. Clients must qualify for this program. Milk and Formula for New Moms | Milk and/or formula are provided to support moms and their babies. This program operates in partnership with the Alberta Health Services who makes the referrals and monitor the health of mom and baby. Best Beginnings Hampers | Best Beginnings is for expecting moms and their families. The program operates in partnership with the Alberta Health Services and Community Links. Women are referred to us and we provide nutritious food support for them while they are expecting. Emergency Packs | A day’s worth of food that doesn’t need preparation including items such as juice boxes, easy open cans, granola bars and high protein nutritious snacks. Packs are distributed by local partner agencies and churches to individuals as needed. Snack Attack | Emergency snack, breakfast and lunch food items are provided to any student who is hungry through 22 school programs in Airdrie and surrounding area. We do not limit items given to what has been donated only – so items are purchased by us as needed. R.J.Hawkey Breakfast Program | A program that feeds breakfast to children aged five to ten every school day. Operating from 7:15 until 8:00 a.m.. this program fills a vital need in the children’s lives, providing nutritional support as well as caring for their social and emotional needs. Bread & Extras | Bread and extra food items are available to anyone in need at any time during our regular office hours. Clients do not need to qualify for this program and are encouraged to stop in any time we are open – and as often as needed to pick up available extras. Community Kitchen Programs | Our Community Kitchen allows us to be more proactive, providing preventative skills to our clients as well as building community. We share this facility with other agencies and with our business community, providing space for them as well as bringing additional revenue and sustainability to our organization. For more information visit our Community Kitchen page. For more information about our Programs, visit our Programs & Services page. When we moved into our building back in 2006 there were 29,035 people living in Airdrie. Fast forward to 2016 and that number has increased to 61,581! As the city expands, so do the number of people who need food support in our area. In 2016, we fed 32,108* people and with your help we can do so much more! * Indicates number of uses, not number of individual people (includes regular hampers, best beginnings, milk for moms & formula and emergency hampers). 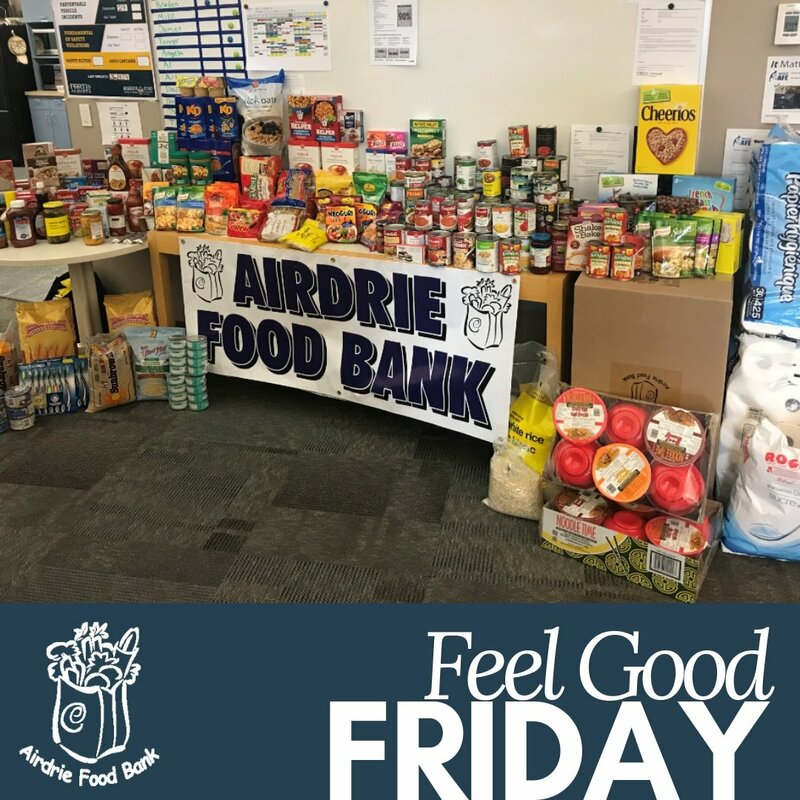 Donations of Food | Food donations can be dropped off at the Airdrie Food Bank during office hours or in drop boxes located in Safeway, Co-op, No Frills, Superstore, Sobeys and/or Walmart. Please see our What’s Needed list which is updated as needed. Donations of Money | Donations of money are just as important as food to keep our organization going. Donations can be made online via Canada Helps or mailed directly to us. We have the ability to accept credit card and debit card donations at our office. Our location is 20 East Lake Way, Airdrie AB T4A 2J3. Donations of Time | The Airdrie Food Bank is empowered by volunteers. We offer opportunities for both individuals and groups. Every volunteer makes a difference to the lives of people in need in Airdrie and area. For more info visit Volunteer Opportunities. Corporate Giving | Local businesses are always welcome to partner with us. Whether volunteering as a team building exercise, sponsoring an event or donating time and/or resources to help us complete our mission, it is always appreciated. Call Lori at 403-948-0063 or email info@airdriefoodbank.com to discuss the best fit for your business. Organize a Food Drive or Fundraising Event | We invite you to use your creativity, skills and knowledge to organize a food or fund drive for your office, school, community group or organization. Please call 403-948-0063 or email us at info@airdriefoodbank.com to let us know what you are doing. Support our Events | You can support us by participating in our events. Join us on Facebook and Twitter and/or check out our Events page for highlights about upcoming food drives and fundraising events. We are so grateful to each and every person in our community for their on-going generous support throughout the year. We couldn’t do what we do without your help. Thank you!